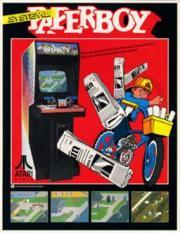 "Well you're not my paperboy"
Torturous... but can be fun in small doses. I actually kinda liked this simplicity of this game, and played it on purpose regularly more than a decade after it first came out. Doesn't mean that it's any good. The setting was always oddly more engaging than the gameplay. Playing the arcade cabinet was a revelation after years of wondering what exactly half the enemies were supposed to be on the NES version. Memorably charming in its way but I don't think I've ever really been sucked into it for more than about fifteen or twenty minutes at a time.